I had a chance to visit the Olema Cemetery in August. It’s a place I’d driven by countless times, but never noticed until last summer. After a two night stay in Stinson Beach, I decided to stop at the cemetery on my drive home, since I was alone and in no hurry to be anywhere. Camera in hand, I walked past the No Trespassing sign and the ugly cyclone fence and ventured inside. Although it was only about 11 a.m., it was already hot and the sun was beating down through a flat blue sky. There was not a single cool, shady spot although the whole place is surrounded and nicely hidden behind a ring of aged cypress trees. Old tin garbage cans overflowed with discarded grave decorations. It was quiet and bright and filled with beautiful statues and stones. Some of the graves were overgrown and untended. The little angel pictured above was totally hidden behind a clump of vines. I just caught a glimpse of white beneath the green and got down on my belly to investigate. Pulling back the vines I found her hiding there. Other graves were better tended, like Fred’s. I love all the knick-knacks strewn around his stone. I can imagine family and friends coming by and dropping off little things that remind them of Fred and the things he enjoyed when he was living. Fred was born the same year as me, and it looks like he died in 19- something. I wonder how long its been since someone came by to visit Fred. I recently found this poem in the back of a Holton-Curry Seventh Grade Reader from 1914. It’s by Max Ehrman, the same guy who wrote The Desiderata. That poem has always seemed a little overwrought to me, but I really love The Prayer, so here it is. Let me do my work each day; and if the darkened hours of despair overcome me, may I not forget the strength that comforted me in the desolation of other times. May I still remember the bright hours that found me walking over the silent hills of my childhood, or dreaming on the margin of the quiet river, when a light glowed within me, and I promised my early God to have courage amid the tempests of the changing years. Spare me from bitterness and from the sharp passions of unguarded moments. May I not forget that poverty and riches are of the spirit. Though the world know me not, may my thoughts and actions be such as shall keep me friendly with myself. Lift my eyes from the earth, and let me not forget the uses of the stars. Forbid that I should judge others, lest I condemn myself. Let me not follow the clamor of the world, but walk calmly in my path. Give me a few friends who will love me for what I am; and keep ever burning before my vagrant steps the kindly light of hope. And though age and infirmity overtake me, and I come not within sight of the castle of my dreams, teach me still to be thankful for life, and for time’s olden memories that are good and sweet; and may the evening’s twilight find me gentle still. In the two months since my previous entry, I lost my wonderful mother, Sandie, to complications from Alzheimer’s, and my sweet little dog Angel, to blood clots in the lungs. Until just about two weeks ago, when we scattered my mom’s ashes, I had been walking around in a haze, unable to even think about making art. Slowly, I’ve begun to peel back the sadness and have restarted my artful journey. I want to thank everyone from my Yahoo! Group who emailed me their kind words of support and empathy, as well as those of you who, through this blog, offered encouragement to me during my mother’s illness. You have no idea how helpful it has been over these last few months, to read your touching, heartfelt comments. Thank you so much. I decided to do a few more pages in The Art of Happiness. Let me tell you a little bit about how I did page 25, which is pictured above. As per usual, I first prepared the pages by painting on a thin layer of fluid matte medium to protect the text. 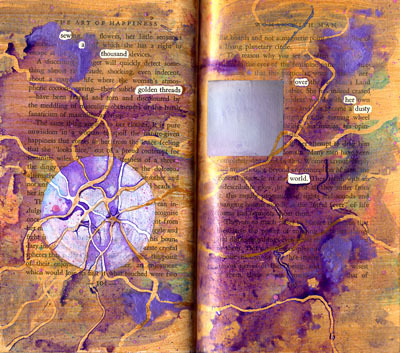 After I had decided on the found poetry, I used my Masquepen to cover the words. I then drew and painted the orb on the left side using white acrylic paing. Next I covered the entire two pages with Lumiere acrylic paint in Sunset Gold, painting around the white circle.. After the paint was dry, I used the Masquepen again to draw lines over the orb and across the page. I knew that I was going to do a watery color wash over the pages, and I wanted to create the impression of golden threads. When the Masquepen had dried, I wrapped the book with waxed paper and fastened it up with a rubber band so that only the two pages I was working on were exposed. I knew what I wanted to do would be wet and messy and that I needed to protect the rest of the book. I painted the pages using in turquoise and magenta. I placed several paper towels on my work space, ready to catch the drippings. Then I used the ink droppers and dropped turquoise and magenta FW acrylic inks onto the page. I used a small water spritzer and sprayed into the pools of ink; then, I lifted the book up and tilted it in different directions so the inks would run together and spread across the page. As the ink puddled-up at the bottom of the page, I blotted it with a paper towel. I used a toothbrush to splatter Pearlescent Acrylic ink in Magenta onto the pages, and also used my Pearlescent purple to drop some colors here and there. I sprayed each drop of ink with water and tilted the book. I also used a little red cocktail straw to blow the ink around the page. I did have a problem with the ink pooling in the gutter of the book. I was worried that it would seep into the other pages, so I used my paper towels and dabbed up as much extra liquid as I could before it could sink in. I’m happy with the way these pages turned out, even though it isn’t exactly what I expected. I was really hoping for more blueish gray to come through, similar to the color on the white circle and my color square. But I love the way the darker colors got trapped along the edges of the Masquepen. Maybe I’ll try this technique on a larger canvas or on water color paper. It sure was a lot of fun. I guess it was almost two years ago now that I finished my altered book A Cup of Sky. Here are two poems that I like from the book. the cup of its shining waters. metal or wood or stone. from the fingers of a fairy. at this gift from the skies. If you like these poems, be sure to visit A Cup of Sky to see the art work and read all the poems from the book. I’m in love with the tatooed girl. peak from under her collar. I believe she cuts her own hair. wanting to be somewhere else. that grows on her back.